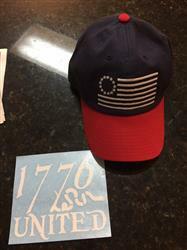 What's more Patriotic than a Red, White, and Blue baseball cap with a Betsy Ross flag embroidered on the front? Not many things. Probably only hotdogs, eagles, and the sport of baseball itself. That was our thinking when we created the Original Thirteen snapback. We combined the Betsy Ross flag with the Join or Die snake and text to make for an iconic American look you can't get anywhere else. Wear it backwards, wear it forwards, the damn thing is patriotic from every angle. I love this Hat, will wear it all the time!! The hat fits perfectly and was exactly as advertised. Quality is on point as well. Loved the color combo! Fits well and looks awesome! People thought the "Join or Die" stitching on the back was the name of the company, then we ended up talking about Benjamin Franklin! Perfect for 4th of July!